When it comes to figuring out what to see and do at any destination, every traveler derives special pleasure from discovering the hidden gems and authentic experiences that uniquely define a place and its people. It can entail tasting new foods, stumbling upon a local with an interesting story, or finding a picturesque trail to hike or take a walk. Most hard-core travelers find a way to balance time spent seeing the “tried and true” vs. time “getting off the beaten path.” It may be trendy to disparage any attraction that reeks of mass tourism but who wouldn’t want to see the Leaning Tower in Pisa or the Eiffel Tower in Paris? Indeed, there are times when it’s worthwhile to follow the hoards of tourists who have been there before us. At least, that’s what I found when we visited the Napa Valley. We retraced the steps and followed the advice of our friends, fellow bloggers, Yelpers, and TripAdvisor members to see and do some of the things that have drawn hoards (estimated at close to 3 million people in 2012 alone) to visit and return to the Napa Valley. There are actually two Welcome Napa Valley signs along Route 29, one in Oakville and another in Calistoga, and the iconic signs got a facelift last year. The signs are probably too wide for selfies but there’s nothing wrong with asking a friendly stranger to take your picture. There will likely be someone around to oblige. In addition to the Michelin three-star French Laundry, Chef Thomas Keller has two other excellent restaurants in Yountville—Ad Hoc and Bouchon—and also oversees operations at the original Bouchon Bakery (which was later cloned in New York). If the restaurant prices are out of your ballpark, take a no-cost early morning walk through the Chef’s organic farm, located across the street from the French Laundry. When you step into the recently renovated Oakville Grocery that was once a gas station, you feel like you’ve stepped back in time. Founded in 1881, it is the longest continually operating grocery story in California although I’m quite sure it didn’t always stock the same gourmet and artisanal food items it does today. Next door to the grocery is one of the best public bathrooms on Route 29. The popularity of this retro-style burger joint, which first opened in St. Helena in 1999, has spread as quickly as some California wildfires. There are now branches of Gott’s Roadside in downtown Napa as well as in the hinterlands of San Francisco and Palo Alto. The concept is one of fast food with great ingredients. On a sunny day, it’s fun to sit outdoors on the picnic tables. During the three-hour ride on the restored vintage Pullman cars of the Napa Valley Wine Train, you’ll be served a gourmet meal (cooked onboard in the Kitchen Car) while you sip wine and see all the town centers and wineries between Napa and St. Helena. There is also a Tasting Car stocked with 30-40 boutique wines, where you can sample four different ones for $10. On a clear day, you can almost see forever. At lunchtime, the terrace of Auberge du Soleil in Rutherford offers one of the most breathtaking views of the Valley and Chef Robert Curry’s farm-to-table menu is inspired. Reservations are a must. One of our favorites was the Robert Mondavi Winery barrel room in Oakville. A 90-minute “experience” features a walk through the vineyards and cellars as well as a sit-down guided wine tasting. It can be challenging to figure out which of the 400 Napa wineries to visit first, second or third. With a temperate Mediterranean climate, lots of sunshine year-round and a valley with a flat floor, Segway tours can be fun. It’s a great way to glide through Napa and cover a lot of ground. The owner of Castello di Amoroso says he was fascinated by Italian medieval architecture. But it takes guts and tenacity for any individual to build an eight-level castle on 171 acres near Calistoga, chiseled out of 8000 tons of stone with 107 rooms, ramparts, towers, a drawbridge and moat. You can read the amazing history of the project here. Definitely worth a peek and the general admission ticket allows you to visit two levels of the castle and enjoy a five-wine tasting. The contemporary tasting room at the Caridean Estate in St. Helena is one of the newest—and most attractive. Some 95 percent of wineries in the Valley are family-owned as is this one. Owners Edwin and Stacia Williams offer 23 different wines from their small-batch boutique winery and are creating a village on the 55-acre property that includes a deli and The Farmer and The Fox, the only British-style gastropub in the Valley. Tell James, the bartender, I sent you. The picturesque main street of St. Helena is filled with upscale boutiques, restaurants, shops and galleries housed in old buildings. If you love architecture, look up. Three blocks of the town have been designated a National Historic District on the National Register of Historic Places. If you have a yen for contemporary Mexican food, stop at La Condesa for tacos and Margaritas. Chocolate-lovers swear by the handmade Woodhouse Chocolate shop; even if you are on a diet, check out the window displays. Both Napa city and Yountville have wonderful public art walks; there are galleries and museums to visit throughout the Valley. DiRosa in Napa is a unique art museum that displays more than 2000 pieces of art indoors and outdoors, in a variety of media, all by Bay-area contemporary artists. For an infinite number of things to see and do, see the Visit Napa Valley website. I don’t drink, so I always thought there wasn’t much of a reason for me to visit Napa Valley until I ready your post. There’s lots to do!! As always, you article and your photos are excellent! Oh, Irene, Wine is SO much more than just about drinking! It has LITERALLY changed the world. The history of wine is rich with intrigue, science, technology, romance and of course there is the “drink”. wine is amazing. That’s the coolest thing about wine it isn’t just for breakfast anymore! 🙂 Cheers! I love the Napa area and would like to visit again and do the wine train + visit all sorts of wineries I didn’t get to on my last visit. One of our favourite outings was a barrel tasting tour at Del Dotto. I was told that Del Dotto is a great place to visit! I’ve been to Napa Valley many times, but from reading this I’m learning at how many things I still need to do. Can’t wait to go again! And I just scratched the surface, too! Fantastic ideas. . .this will be good reference material when we do head that direction! Hope you have the opportunity! Been to Napa once and Sonoma another time. Gotta go back because I just missed the place now that you wrote about it. Besides, that’s my huband’s fave place! Thanks! The French Laundry is high on my culinary bucket list. I didn’t know Keller had two other restaurants in Napa- will have to check them out online. Great round-up! Be forewarned. I’ve been to Napa twice and still haven’t made it to French Laundry. Reservations need to be made about two months in advance, I’ve heard. Apparently now, reservations are one month in advance. We called everyday and got waitlisted. Finally I recruited my daughter and husband, 767 phone calls later and we have a reservation. Can’t wait to go. How fortunate you are to have gotten through—albeit with great persistence! Hope it’s even better than expected! I’d love to ride in one of those restored vintage Pullman cars on the Napa Valley Wine Train…it looks like a relaxing way to see the countryside and sample some local wines. Last time I was in Napa Valley I was there for work so spent most of my time driving around going to appointments so a return visit is definitely in order. And each of the four seasons has distinct pleasures so there is no wrong time to go! It looks like a wonderful tour. My daughter visited Napa Valley and thought the wine tasting was expensive. I’m from Washington state. Many new wineries are opening in the state, including in Central Washington where I grew up. My sister and I have visited about two dozen wineries as we travel around the state. I suggest people check out wineries in their areas, in addition to traveling to the famous wineries in the United States and other countries. Irene: I am so glad to see you feature the Napa Valley. The earthquake affected so many small businesses and they need more tourists to visit. I have been several times and have even eaten at the French Laundry – it was out of this world. I have never done the Wine Train or ridden a Segway! Great post! 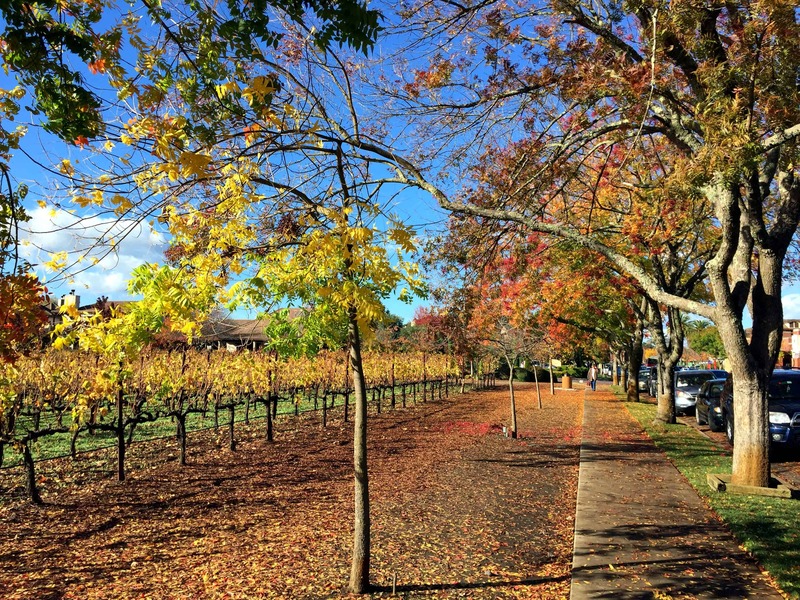 Every season is a great season to visit Napa! great post, Irene. We loved tasting our way thru CA wine country last fall. There is indeed so much to see, do, and taste! Thanks for the Napa Valley “must do” tips. We’ve sipped and supped in Sonoma, but not Napa – but it’s on our wishlist! Next time we visit Napa, I’m going to be sure to “cross the border” and get a taste of Sonoma too! Looks like a lot of fun, great photos! It’s years since I’ve wandered around Napa. Clearly, it’s time to go again…especially the Wine Train. Rather fancy the French Laundry, too. 🙂 Thanks for the nudge! Nice round-up for what to see/do in Napa which is about an hour’s drive from my home near San Francisco. I’ve been there many times over the past 40-odd years. Here’s a short piece I wrote about art and architecture in Napa: http://bit.ly/1w3cyHH — you’ve covered two of those places. Unlike Napa, Sonoma County has several wine growing areas stretching over a large geographical area. And there are plenty of good restaurants as well. Any time of year, you’ll usually encounter fewer tourists than in the Napa Valley. And Napa is on my list! I think I would do a bike tour instead of Segway (but they look fun). Bike tours are very popular in Napa; many offer “sip and ride” options, too! Wow Napa looks beautiful! I love red wine and have always wanted to go visit a winery. The Wine Train sounds like a neat way to combine wine tasting and sightseeing! What was your favorite part of the trip? Probably our dinner at Michael Chiarello’s Bottega!